A Mass honoring Our Lady of Altagracia, patron of the Dominican Republic, was celebrated at Our Lady of Mercy Church in Brownsville, Jan. 19. Nearly 200 parishioners from the parish and the local Hispanic community participated in the Mass celebrated by Dominican-born Father Ambiorix de Jesús Osorio. Father Edward Mason, pastor of Our Lady of the Presentation-Our Lady of Mercy parish, concelebrated the Mass. 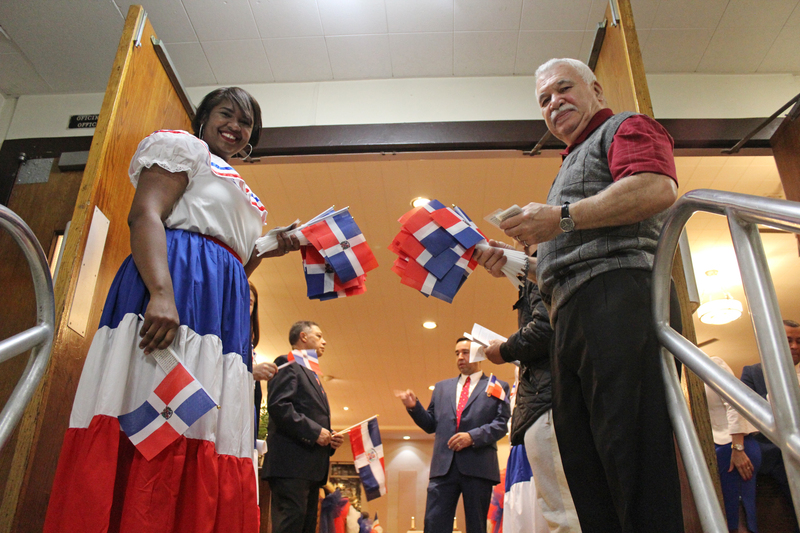 Members of the parish’s Altagraciano Committee were in charge of decorating the chapel in the colors of the Dominican flag – blue, white and red. They also organized a celebration after Mass with traditional food and music from the Dominican Republic. Upon entering the chapel, attendees were given Dominican flags, prayer cards with the image and a prayer to Our Lady of Altagracia, and a small booklet with the lyrics of the opening and concluding hymns for this Marian feast, as well as the lyrics of the national Dominican anthem. In his homily, Father Osorio stressed the importance of recognizing one’s own national and cultural identity, as well as of preserving and cultivating one’s own traditions, while respecting and valuing those of others. Father Osorio also described in detail the image of Our Lady of Altagracia, explaining its Christological, Mariological and ecclesiological content. At the conclusion of the Mass, Father Mason thanked the Altagraciano Committee and invited attendees to the cultural dinner and celebration that followed. “I know that there are not only Dominicans gathered here,” he said. “Where are the Puerto Ricans? The Ecuadorians? The Colombians? The Hondurans? The Mexicans? It seems that the parish secretary and I are the only ‘gringos’ here,” said Father Mason, in Spanish, making the attendees laugh out loud.